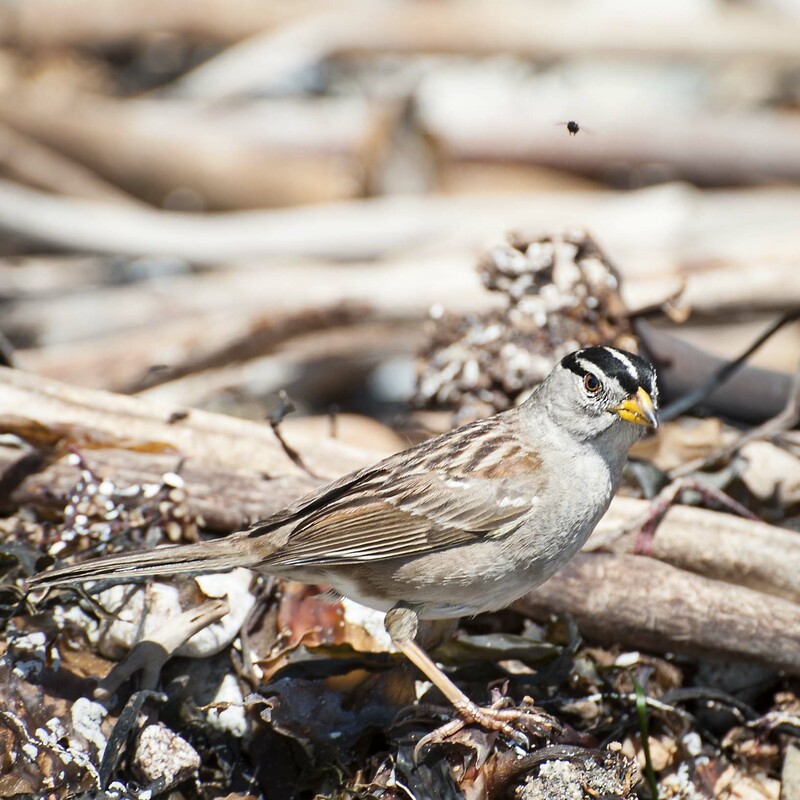 A White-Crowned sparrow searching the sea wrack for his next tasty meal. Little does he know one is lurking right over his head. Photographed on the Northern California Coast. …these birds migrate up here to British Columbia almost to the day in the middle of May — en masse and take over the feeders and fill the air with their very distinctive song, scratching and nosing about everything in a kind of frantic, determined way. I really like this photograph. They are humorous to observe. HI, that an great observation and it is amazing how there are times that birds show-up in an area almost to a specific date. Hope your weekend was well and your week off to a great start. I like that shot a lot. Thanks Alix, hope your week is off to a great start. Thanks and thanks for taking the time to give some feedback. It is much appreciated. Have a great day. Fantastic photo, Mike–the clarity is impeccable. A glorious bird with incredible song. Thanks Jet, it is always a pleasure to get to hear their song. Hope your day is going well. Gorgeous bird and shot!! That black on it’s head in so beautifully captured in your shot!!! Such great timing, fantastic shot! Hi and thanks, we were watching these guys go about trying to collect the sand flies and other insects on the beach for quite some time and getting the fly just above this Sparrows head was probably just dumb luck. These are my favorite sparrows. In Maryland (where I live) we only get them during the winter and they really liven up the cold bare scenery with their warm melodies 🙂 I can’t wait for them to come back! I love this photo. Hi and thanks, we have the opposite here in that they only show up on the summer and mainly in the high country. In winter its Juncos and Chickadees that liven things up.